Marco te Brömmelstroet, Associate Professor in Urban Planning at University of Amsterdam and head of the Urban Cycling Institute, is known as “The Cycling Professor.” He can be seen in the video “Why We Cycle,” which is currently being screened around the world. Energy consultant Ben Paulos interviewed Brömmelstroet when he visited Berkeley recently with a delegation of grad students studying transportation systems. They talked about how the Netherlands became the bicycling capital of the world and how other communities can–or can’t–follow suit. Below is a lightly edited version of their interview. Note: The interview was originally posted at Energytransition.org. It is reposted here with permission. Ben Paulos: What’s so special about cycling in The Netherlands? Marco te Brömmelstroet: As a Dutchman, you are not aware of cycling. It is like an American is not aware of cars. It’s just something that is around and you use, and it’s nothing special. It’s like drinking water from a tap. Cycling is just ingrained in society. As an eight-year-old in the Netherlands, you are able to cycle to school in a safe way. No parents need to bring you. This has a tremendous effect on the feeling of autonomy of young children, which could explain why Dutch children are among the happiest in the world. On a societal level, cycling has a reciprocal relationship with egalitarianism. Dutch society is quite flat. Even the king or ministers know that it works in their favor to show they are normal. On various targeted occasions they use the bicycle to show that. If they need some attention they ride their bicycles to work, in their suit–but they make sure there is a photograph. In the Netherlands we don’t show off by consumption, but by non-consumption. The king would be on a rickety bicycle, never on a very fancy bicycle. One made in the Netherlands. Also, if you bike around the city every morning you see and acknowledge other people, and negotiate with all these people. We have way fewer traffic signals in Amsterdam [than in the U.S.], because they are not necessary. In many intersections cyclists are in the majority, and they solve traffic rules in more of a swarm way. They nod to each other, and use body language. It goes very efficiently. In that process you meet your social environment. In a week, chances are I will meet at least one famous Dutch person, since they are also cycling; they are part of the game. I will also meet tourists, poor people–all layers of society. So it’s very different from the U.S.? I came [to the U.C. Berkeley campus] just now in an Uber. It’s safe; I’m in my own bubble. The students I’m here with, especially the women, don’t feel safe [on bicycles], even here in Berkeley. Uber is a solution for that, but it makes you isolated, in a bubble going through the city. You are only meeting the driver. You can imagine what will happen with a self-driving car: nobody will meet anyone. You can see it here on campus where students walk around chatting, meeting others with– how do you call that–serendipity? You see someone you weren’t expecting. You meet and greet and hug. That happens a lot on the streets of Amsterdam. If I’m cycling around Amsterdam and I lose my way I can always ask someone. I was riding my bike [from Berkeley] to Livermore and looking for the way, but everyone was in a car. There was nobody on the sidewalk, no one on a bike–so no one to ask for help. So these are some examples of how cycling is ingrained in Dutch society. As a social scientist that’s what makes it very interesting, and is a topic I will keep on researching. For many years we had a lot of funding going into research on sustainable mobility, so all the universities were researching it. But none of them mentioned cycling whatsoever. Suddenly the Dutch [people] became more aware of what was happening, and wanted better policy, so they were looking for research on it. There were no researchers interested in cycling, just this crazy guy in Amsterdam–me. I had a bicycle shop, I was a PhD candidate and then assistant professor. I became the go-to guy. Now, four or five years later, we have forty PhD students in the Netherlands studying cycling in different universities and domains. My daily work now is to solidify that, to bring people together to keep it going. The Netherlands has 35,000 kilometers of dedicated bike lane, but they didn’t really emerge until the 1970s. Did cycling predate the infrastructure, or did the infrastructure enable the cycling? What motivated so much infrastructure? I think cycling predates the infrastructure, in the same way children playing in the streets predated playgrounds. Cycling infrastructure was not necessary before the car came in. You could cycle in the streets and play in the streets. When the car came, traffic engineering became the dominant paradigm and other users of the streets had to be pushed aside. The main reason why the first bicycle paths were developed in the Netherlands was to keep the car traffic flowing at high speed — for the benefit of cars, not the cyclists. Car companies were pushing for bicycle lanes, to separate them. In the U.S., John Forester pushed for the idea of “vehicular cycling” [in which bikes share space with cars]. That makes sense from a democratic point of view, but it completely ignores the huge equality issue — [between] a cyclist and [a driver] in a cage weighing ten or one hundred times as much. We had some cycling infrastructure in place before the ’70s, but then a perfect storm happened. We were inviting architects and urban designers from the U.S. to solve the issue of cars congesting our cities. Since we had it all worked out! A famous Robert Moses-kind of designer came to Amsterdam, and made a master plan. If you see the plan, you see how close Amsterdam came to being destroyed by highways and modernist buildings. And we started building it! We started demolishing the houses and building the freeways. But in 1973 or 1974 there was a popular uprising because of all kinds of things – the oil crisis, social crisis, housing crisis – even the rich elite were involved. One of the central themes was “Stop de Kindermoord” or “Stop Killing our Children.” At the time there were over 3,000 traffic fatalities per year; many of them were children. The uprising pushed into motion the stopping of new highways. After that you couldn’t come with plans for highways through cities any more. Plans shifted to building things in neighborhoods. One thing that came out of it was traffic calming. In many places there is no space for dedicated bicycle lanes, so they set speed limits of 30 kph or less, which turns them basically into bicycle boulevards. That kicked off a long-term process. In 1992 we had a referendum in Amsterdam to make the entire city car free, which we lost by a few votes. But since then, without talking about it too much, the policy has become to phase out the car. Twenty-five years later, you see the results. In 1992, the majority of trips in Amsterdam were by car. Now, they are almost completely gone. The bicycle is around fifty or sixty percent. It wasn’t due to a big claim or policy, just a very gradual change. And it wasn’t a transport policy against cars, but [one focused on making] the streets more livable. How do you overcome resistance, since you need to displace cars if you want to use the space for bicycle infrastructure? True, people see it as their right to park their car in a public space. But we tend to use the wrong language. We say “making it car-free” or removing cars. Instead you can say we are “making it child friendly” and creating more space to be outside. In the Netherlands, when you say “car-free,” people see it as the exact same street but without cars, and they are against that. But you should show that you can do something different with the street that improves the quality for everyone living there. Right now, if your children want to play somewhere you have to walk them to the playground. Why not switch that logic and put your cars at the playground and put the playground in the street? We often think we need the big statements and leadership, but leadership can also be not to talk about things but just do them. But some American cities are just so far away from that model. In Fresno, for example. That city is designed to create smog: it is really spread out, the streets are really wide, everyone drives everywhere. Then the heat and sun turn all those car emissions into ozone, making it one of the most polluted cities in America. But the wide streets would make it easy to do bike lanes or bus rapid transit (BRT) lanes. My starting point is land use and mobility. You could do bike lanes [in Fresno], but it doesn’t solve the density problem. Thinking about San Ramon, the bike infrastructure there is not bad. But culturally you feel like a stranger, or a nuisance. You are allowed on the street, but that’s it. Underneath this there are much deeper institutional and social problems, and racial and cultural issues that make it even more depressing. I find it hard to see where to start here. In some places in the U.S., I’m willing to give up and say that European solutions will not work. I can’t see it happening. The least worst thing you can do is to get people into electric, self-driving, safe cars. But I’m still not satisfied with that, because it still means a very poor social fabric, people not meeting each other, people not getting physical activity. There are all these elements that are not solved. I’m becoming very aware of my naiveté. By traveling abroad, I can see how the bicycle is a very specific and simple way to solve many complex problems. And now you are exporting this knowledge to the world? We have 150 delegations annually coming to Amsterdam to learn about cycling. The Dutch Cycling Embassy is doing this now for consultants. But cycling itself is not so interesting. You put Ford GoBikes here, and then you have bikes. It’s the entire system and the culture around it, and what it means for city life, that is interesting. In the Netherlands, eighty percent of the population lives within biking distance of a train station, and has an average of 3.4 stations nearby. We have this hugely flexible system that completely wipes out the car. It has speed, flexibility, built-in exercise and sociability, you can go everywhere and get a bike on the other side. That system can work in many places around the world. The real innovation is seeing bicycles and trains as one mode, not separate modes, not a feeder system. So for example, I wanted to go from Berkeley to Walnut Creek, so instead of going to my nearest BART station and transferring, I rode to the other line and just took one train. Where the catchment areas overlap, that’s where the magic happens. You see it reflected in housing prices. From my university in central Amsterdam I can choose between 200 different trains within a twenty-minute bike ride, in all directions and speeds. A car would be a hassle for me now. I have one transit card, I have exact online information, I know which stations have good coffee. We have 600,000 passengers coming [to the trains] by bike, and so [we have] major bike parking issues. 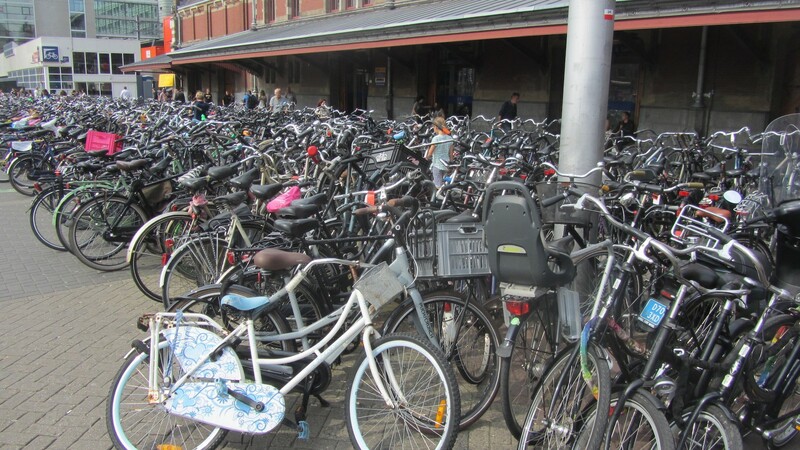 Some say “look at all the parked bikes at the station, what a problem.” But that’s not a problem – just a symptom of something that is hugely successful, despite the fact that we didn’t plan for it. It’s our luxury problem. So we are working on connecting a bike rental system to the trains and just trying to build more bike capacity at stations, because we are a bit embarrassed. Dutch policymakers don’t like it. It’s a mess. But it’s a beautiful problem to have. One of the coldest winters I’ve ever experienced was a week in Amsterdam. Even then it looked as if getting to work by bike was still popular. It is my understanding that when there is ice coating everything the cycling to work/school isn’t as common. Yes, here’s a more detailed look at a specific city (Fontana), but there are communities that are similarly dense all across the state as this is a prototypical sprawl neighborhood. The “but The Netherlands is so flat” excuse is one of the flimsiest. Not ALL of the country is pancake flat and the headwinds actually are just as bad as hills. Additionally, even if being “flat” is a prerequisite, we still have hundreds of communities in America which are similarly as flat as The NLs, so there’s no reason why we can’t work on improving them. I’ve been to the Netherlands and have experienced the well thought out bicycling paths. But, as some one pointed out… it’s because the Netherlands are FLAT! Then how come the bicycle is also a very well accepted (and used) mode of transportation in Germany where the terrain is considerably less-than-flat? Winters were colder 70 + years ago when I was a kid. At least I think they were. There’s scientific evidence that the earth is getting warmer…. Ah yes… It IS getting warmer! I can’t ride my bike in flat as a pancake San Jose because there’s a mountain in Mountain View! I can’t ride my bike to the grocery because there aren’t enough people! I would say that it’s preposterous to assert that the fifth-largest city in the state has “density problem[s]” that prevent it from making good use of high-quality bike infrastructure, but that skepticism extends even to smaller cities. Most cities in California have community densities that are as high or even higher than the density of smaller Dutch towns and villages that have no problem seeing the value of bike infrastructure. In fact, some of the best Dutch bike infrastructure exists in areas that are quite rural and the province considered by many Dutch people to be the best for biking is the least-dense of all. While I would agree that not everything is automatically applicable without even so much as a couple tweaks (particularly to conform with local laws), saying that we should just “give up” on those areas also isn’t a productive or the right approach to the situation. Neither are electric cars, which maintain the same geometry problems as regular cars, just with the emissions exported. Culture is irrelevant, as is the CA-NLs comparison based on population density derived solely by dividing population by land area. 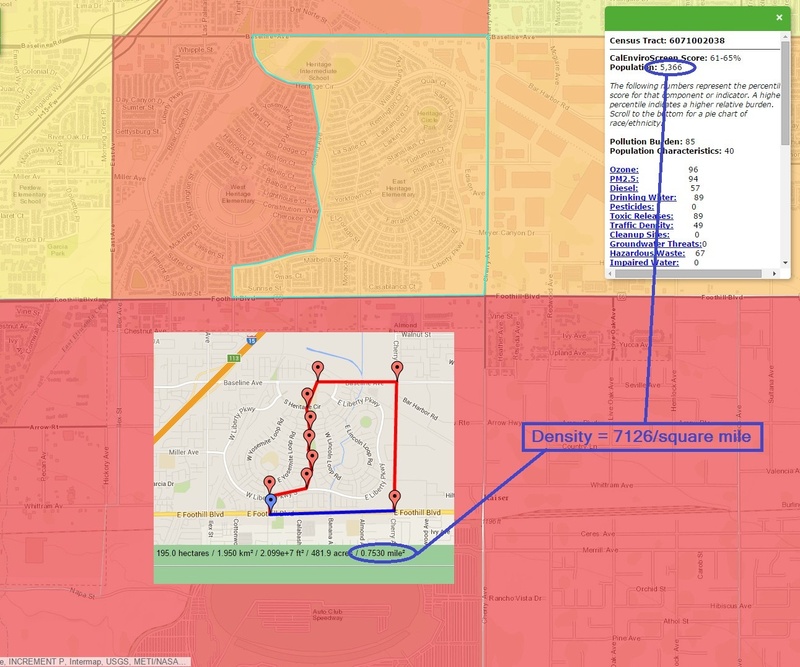 While yes, The NLs does have a higher density overall than the state of California, actual density on the ground varies widely in both locations, with some iconic Dutch biking cities such as Houten being less dense than places like Rancho Cucamonga. Additionally, arguably the best bike infrastructure in the country is in the less dense areas and the province considered to be the most bike-friendly by other Dutch is the least dense in the country. Most communities in the metropolitan areas of California are absolutely denser than Drenthe. I think that people should be educated, encouraged and persuaded to make the right decisions, but when you start getting coercive, you lose me. I’m all about the carrot. The stick, not so much. Correlation is not causation. As for you, you should move. Americans like single family homes and personal transportation so much that one in six is on antidepressants. I live in suburban USA. It can be soul sucking. Wait. Did you just proffer the tired old “it is freezing cold right now and that proves global warming is wrong” argument? That was discredited back in the 1990s. You do know there is a difference between “climate” and “weather”, right? 80% of all the feel good planning dreams are failures wasting valuable dollars to keep planners in a job. Almost all of the concentric population plans are a disaster, you all live within 3 to 5 miles of a population center is a joke and another bottomless bucket of pipe dreams. And by the way, with the Polar Vortex cremating the upper northern parts of Canada and the US, where is the global warning pundits? I love it when a liberal socialistic plan fails! Of course, people bike in such numbers in the Netherlands because it is flat as a pancake with an area of 16,412 sq. mi, and a population of 17.08 million. By comparison, California has over twice the population spread out over an area of ten time the size and has mountain ranges that reach over 14,000 feet. Culturally, the US and the Netherlands are also quite different. The professor doesn’t seem to understand this. He says: “Uber …makes you isolated, in a bubble going through the city. You are only meeting the driver.You can imagine what will happen with a self-driving car: nobody will meet anyone” and “culturally you feel like a stranger, or a nuisance. You are allowed on the street, but that’s it.” People LIKE being in their bubbles. That’s why people in the suburbs like single-family homes and drive. They want to be left alone. At least the professor realizes that European solutions will not work in the United States, because guess what…we’re not Europe and we never will be. A San Francisco Bay Area Planning and Urban Research Association panel concludes: San Francisco has made strides in increasing bicycling mode share, but its bike infrastructure is still bad. Thousands of people in North America are exposed to rules of thumb in cycling training courses each year. But how good is the advice?